✔ 【1024 x 768 HD Resolution】: Featuring with 1024 x 768 High-definition resolution, delivers vibrant and exquisite image with true color in HD, so as to upgrade your visual experience and enjoyment. ✔ 【Multi Video Interfaces】: Supporting AV, VGA, BNC, HDMI video interfaces with expansive connectivity and strong versatility, in line with diversified system requirements and application fields. High sensitivity, strong anti-jamming. ✔ 【 Installation Alternatives】: Installed with a pivot and adjustable stand, works as a regular desk companion. Or mounting on the wall with VESA 75mm mount (not included), distinctly extend the visible scope. ✔ 【Wide Applications】: With BNC input, perfect for CCTV security system and DVR. 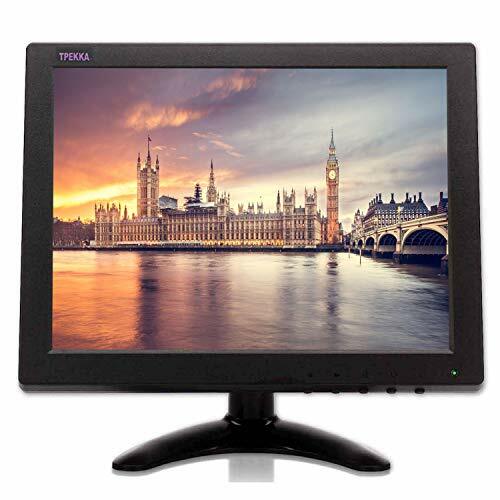 Or as a second display for computer PC monitor with HDMI/ VGA input. As a rear view camera monitor through AV input. Suitable for indoor or outdoor use, for gaming monitor, or FPV/DVD. ✔ 【Support and Warranty】: Package includes 1 x Monitor, 1 x BNC Cable, 1 x Bracket, 1 x User Manual, 1 x Power Supply. We offer 12 months warranty on item(s) damaged during the shipping or confirmed to be a manufactory defect. Friendly customer service responses within 24 hours on business days. If you have any questions about this product by TPEKKA, contact us by completing and submitting the form below. If you are looking for a specif part number, please include it with your message.